I hate bad violence but I support good violence. There are two kinds of violence namely, good violence and bad violence. 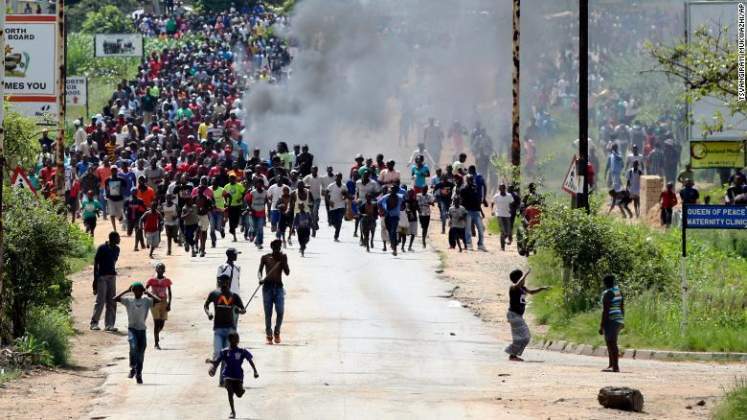 Bad violence is the one that was engineered by ZANU and ZANU PF against the murdered 20,000 innocent civilians in Matabeleland and the MDC victims of 2008 runoff/ August 1 2018 victims respectively. You should also not forget the DRC violence by the state perpetrated against the innocent civilians as a good example of bad violence. Why should ZANU PF attend Morgen Tsvangirai's memorial service when they have just burnt his only surviving legacy Morgan Tsvangirai/Harvest House? I can see violence more than what I saw on 14/01/2019. Tsvangirai's memorial service should be postponed pending the investigation on who burned Morgan Tsvangirai/Harvest House. Tsvangirai turned in his grave. Today, ZANU PF thugs saw it fit to burn Morgan Tsvangirai/Harvest House in Harare (and want ZANU PF to join his memorial services in few days to come) MDC Alliance should not allow ZANU PF (without apology) to be there, Destroying Morgan Tsvangirai house is like killing the legacy of him. This is another kind of bad violence because MDC Alliance is not being involved in the current demonstrations and they destroyed the only house named after the late Tsvangirai in Zimbabwe. The aim of ZANU PF is to politicize the genuine demonstrations of the citizens that is guaranteed by our constitution. I had a chance to talk to President (of the people) Nelson Chamisa's top allies, they told me that MDC Alliance supports the ZCTU demos though not involved. Because of the burning of Morgan Tsvangirai/Harvest House, it is either the memorial service should be postponed or ZANU PF should not attend. Or ED and Chamisa should engage ahead of the memorial service. You cannot destroy the statue of Nelson Mandela and purport to be with his supporters. I have seen (bad/good) violence during the memorial service of the late Tsvangirai. The security services should neutralize this in advance. The burning of MDC Alliance HQ now vindicates Prof Jonathan Moyo. According to Strive Masiyiwa, Moyo was responsible for the bombing of Daily Newspaper HQ. The same way it (Daily News HQ) was bombed is the same way Morgan Tsvangirai/Harvest House has been bombed by alleged ZANU PF youths. It is now obvious that Daily Newspaper HQ was bombed by ZANU PF youths and not Jonathan Moyo. If Jonathan Moyo was responsible for the bombing of the Daily Newspaper HQ therefore he is the same person who bombed Morgan Tsvangirai/Harvest house on 14/01/2019. Zimbabweans should join me in apologizing to our innocent Prof Jonathan Moyo on behalf of Strive Masiyiwa. Let us leave the issue of ZANU PF's bad violence and migrate to the other type of violence called good violence. You remember that during the liberation struggle, two important events happened in the history of the Zimbabwean struggle. First, the current President ED Mnangagwa is alleged to have bombed a train in Masvingo (I think I am right). Finally, Joice Mujuru brought down a Choppa that was 35km away in the clouds. Unfortunately, we don't have statistics of the people who lost their lives during ED Mnangagwa train bombing and the Joice Mujuru-Choppa shooting by the alleged AK 47 which the former President's adviser is protesting. However, the war veterans are still celebrating the train bombing by HE ED Mnangagwa together with the fellow ZANU PF self-endorsed original members while the G40 members headed by Jealousy are also celebrating Joice Mujuru's killings (by Choppa) from another corner. What Zimbabweans should take home is that, the ED Mnangagwa and Joice Mujuru acts during the struggle are a good examples of good violence. I have respect for the VP Chiwenga too, he suffered during the liberation struggle (sometimes becoming violent in order for us to become independent). Basing on the economic figures and the sufferings of Zimbabweans, Zimbabwe is now back to Rhodesia and another savior is needed. "Having a 76 year old as a president is not different from having a 94 year old goal keeper at Manchester United". R.G Mugabe, Mnagagwa and other ZANU PF elite above 70 years should know that time is up for them. Even if they use soldiers, they won't stop and silence the voice of people/God. They need to go for retirement unless ZANU PF youths can convince me. "We cannot die for the sins of our fathers in the Bible at the same time dying for the sins of ED Mnagagwa and Mugabe". It was good violence that brought the Government of National unity in 2008 in Zimbabwe. It was good violence that chased Smith from power, it was good violence that chased RG Mugabe from power and good violence can also remove ED from power as well. The acting president Chiwenga is alleged by George Charamba to be considering a state of emergency so that president can finish his honeymoon in Davos and Russia. Was the removal of RG Mugabe from power by you (army) not violent? Did you remove Mugabe by erekisheni? How many people died during the 2017 coup? If Mugabe was removed violently, anything can happen to any leader of any organization. A revolution is not always sweet but violent. Change can change anyone. We told you that removing a legitimate president by violence is a wrong precedent, today, history is about to repeating itself. Do not take RG Mugabe for granted, he can set the country on fire. 'For the first time to see ununiformed people with guns in Zimbabwe'. Arrest Mugabe before arresting Nelson Chamisa, G40 has brains, ED has muscles and Chamisa have young & unstoppable-blood that will take care of you in people's old homes. ZANU PF should be worried.